Working at the SCC: Meet Our Pastry Chef, Erin Clarke! Have you ever wondered what exactly goes on behind the scenes at the Edmonton Convention Centre (SCC)? We are publishing a series of articles on our blog that highlight some of the staff that work with and at the Edmonton Convention Centre (SCC). Our last post spotlighted Jennifer Bergman, a Wedding Planner who organizes several weddings each year at the SCC. For today’s post, we met with Erin Clarke, one of the Pastry Chefs who has been in our kitchen for three and a half years. She helps create all the delectable desserts and breads that we serve to our guests. Erin assembling several hundred pastries for an event at the SCC. On a normal day, I start work at 7 am, which is common for Pastry Chefs. The first thing I do is look over the functions that are happening that day, as well as our daily task list. We have a print-off of the entire week’s jobs so we can prepare for what is to come. At 7 am, we have a meeting in the pastry kitchen. There are about eight people working in the pastry department, so we discuss what needs to be done that day and split up the tasks. Most mornings, there are small breakfast functions and meetings happening at the centre for groups of about 10 people. We take care of those functions early in the day and then move on to lunch events. We create all the buns and desserts for lunch and make four different kinds of buns in-house. Some are made day-of, but others are made ahead and put in the fridge to rise until we need to pop them in the oven. Occasionally we will make cracker bread or breadsticks for the salad or main dish. Or, like today, we make coconut roti and pizza dough. We don’t make the gluten-free bread in house, but we do make the gluten-free desserts here. 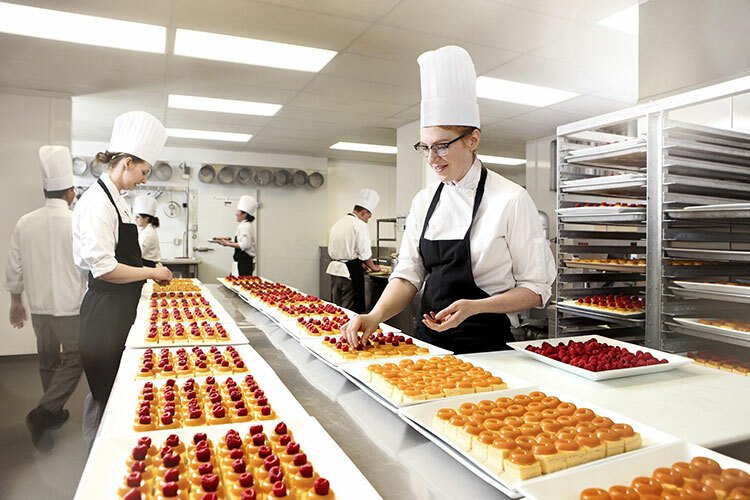 What do you think are some of the most spectacular accomplishments in your career as a Pastry Chef? I’m more practical when it comes to deciding what is spectacular. When we have functions where we feed 2,000 people, that feels like an accomplishment. For some events, we make big elaborate chocolate and sugar showpieces. The tallest one was a four-foot masquerade-themed sculpture for our Christmas Party. It was made entirely out of chocolate and completely edible. We started preparations two weeks in advance — the great thing about chocolate is it never goes bad. When you are making a piece like this, you create the structure, and then sand it and spray it with coloured cocoa butter after to add detail. The actual assembly and finesse generally happens in the last couple of days. 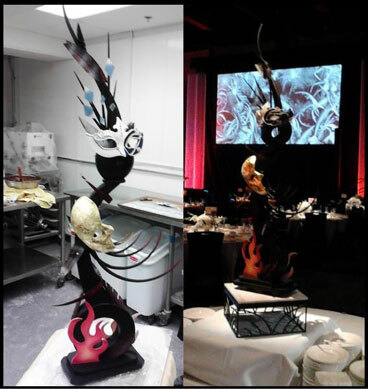 The 100% edible four-foot masquerade-themed sculpture made of chocolate and sugar. 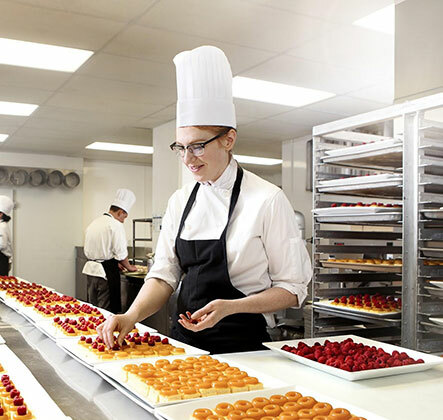 What got you interested in becoming a Pastry Chef? When I was in high school, I looked into the baking program, but went to The University of Alberta School of Business instead. I completed an accounting degree and then went to NAIT to attend their baking program. I wanted something more fast-paced that involved working with my hands. I find this so much more satisfying. I enjoy the regimented, mathematical, and scientific parts of baking. Then, the creative expression is in the decorating. I started my practicum at SCC and got hired at the end of it, which was three and a half years ago. What are the three most essential tools that you use every day? 1. Paring knife — from cutting strawberries to picking things up, a paring knife comes in handy all the time. 2. Offset spatula — for spreading icing or putting cake batter in a pan, it helps lifting and transporting things. 3. Silicone spatula — for stirring and scraping. What was it like studying to become a Pastry Chef? I studied at NAIT — which was pretty fun! It is stressful, and as students, we probably don’t eat as much as you think we would. They actually sell everything we create in the store on campus. But, you never know if you screwed up your recipe unless you taste it, so we did have to try a bit of our baking. When you are studying, you spend your mornings in the kitchen. There are demo days each week where teachers show you how make a particular recipe. Then, you spend two days actually making the recipes yourself. All our afternoons are spent in theory classes — like sanitation, nutrition, trade calculations, baking theories, and communications. Every day, you have four hours of lab, then two hours of theory. At the end of a unit, you have practical and written exams where your work is graded on look, taste, time, and yield. What do you think is the most annoying pastry to prepare? The Napoleon Slice. It is several pieces of puff pastry stacked on top of each other, with pastry cream sandwiched between each layer. The tricky part is that you have to make sure to cut each piece exactly the same height. However, they warp, so it isn’t that easy to keep them that way. Then, you have to assemble the pastry quickly to get it out as soon as possible. Macarons are a bit finicky as well, but very popular. The consistency varies, and you end up with different sizes. If you overmix them the tiniest bit, they look different than they are supposed to. What emerging trends do you see in the pastry scene? Eclairs have been getting popular lately; elaborate ones with more intricate decorations and interesting toppings. I like lighter and fruitier desserts. A simple pie with whatever fruit is in season. Or a galette — I love galettes because they are something you can put together quickly. They are much easier than making a pie, but look just as nice and takes less time. They are simple, but with the right fruits they are more flavourful than many other desserts. What do you think is the most under appreciated baking ingredient? Butter. But it’s not actually under appreciated at all, so I’d have to say salt. Salt is so important! You only add a tiny bit to a recipe, but when you forget to add it, there is such a difference. It makes everything pop and the flavours are more intense. Do you create custom pastries for special events? What do you draw inspiration from when creating new recipes? Yes, we create custom pastries quite often. For some companies, we do edible logos, or if a certain function has a particular theme, we will create food around that. For example, one event had a carnival theme. We created variations of classic carnival food for it, like a mini apple white chocolate truffle (that looked like a candy apple), popcorn flavoured ice cream, and mini doughnuts. We find something traditional that aligns with the theme and execute it in a modern way. Working with people. Everyone on our team is great, and I love working with this team. In general, I enjoy working on things that give me concrete proof of what I have done that day. I like the satisfaction of seeing the finished product. What are some of the ideas you have tried that worked well? Have there been any that flopped? A dish that turned out amazing was a recent VIP dessert. The Pastry Sous-Chef, Jason, was creating a lemon and olive dessert. It had an olive oil emulsion and candied olives, but with lemon frozen yogurt. It was a complex taste that turned out so well. It was one of those recipes that sounded awful on paper, but actually worked out really great. One time, we tested a rye-flavoured pastry cream for an eclair in a small batch. It worked out well in a small batch, but then in a large batch, it was a goopy mess. To flavour the cream, you have to soak rye bread in milk and then squeeze it out. When we tried to make it bigger, it was just soggy and gross! Are there any foods that you always have at home? What advice or resources would you recommend to aspiring Pastry Chefs? I would recommend that they buy one of the more textbook-like books on the market, such as The Professional Pastry Chef or Advanced Bread and Pastry. These are written in a more formulaic format. It is important to get used to working this way because then you can adjust the recipes easily to scale. As well, these books have more explanation about how stuff works. They give you the reason why you don’t want to mix too much or add too much water. Both explain how to create different textures and why you would want to maintain a certain texture for a particular type of pastry. Having this degree of detail makes it easier to control everything and create a better final product. To become a more advanced baker, find resources that provide detailed explanations on why you do the things you do. Technical know-how is essential.